Argentina international Joaquin Tuculet was making his debut for the Blues. 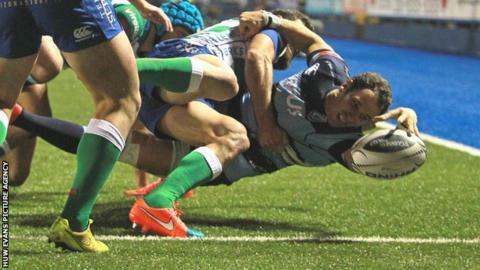 Cardiff Blues survived a second-half fight-back by Treviso to claim only their second Pro 12 win of the season. Tries by Lloyd Williams, Joaquin Tuculet, Richard Smith, Kristian Davey and Rory Watts-Jones earned a bonus point with Gareth Anscombe and Gareth Davies kicking the rest. Blues led by 16 points on the hour but were pegged back by two tries by Francesco Minto to add to Joe Carlisle's first-half touchdown. Fly-half Carlisle kicked 10 points. The Blues' first home win of the season helped them open a six point gap over Welsh rivals Newport Gwent Dragons in the table. The match had significant interest for the Blues with Argentina international Tuculet making his debut and Anscombe making his first appearance in the number 10 shirt. And with the Welsh region dominating possession against winless Treviso in the opening exchanges, both were in the thick of the action. However, the home team's dominance was fruitless with the first points coming from the boot Treviso fly-half Carlisle after Macauley Cook stopped a promising breakout with a deliberate knock on. Cook received a yellow card, but while he was in the sin bin scrum-half Williams dummied over from close range after 16 phases of possession in the Treviso 22. And the impressive Tuculet marked his debut by twisting and stretching for a fine try wide on the left after a simple passing move. But the Blues were hampered by a series of unforced errors and were punished when a poor kick from deep gave the Italian team a chance to counter-attack. Carlisle's speculative chip bounced awkwardly for Anscombe and the fly half re-gathered and scored out wide and converted before kicking a penalty to give Treviso a 13-12 lead at the interval. Anscombe did not emerge for the second half, and his replacement Davies quickly got into the action with a penalty to put the Blues back into the lead. And on the 51st minute a superb run and pass by centre Gavin Evans put Smith over in the right corner, Davies converting. And when Dacey crossed after a well-worked lineout move, the game appeared to be in the bag. But substitute flanker Minto's two touchdowns in six minutes pegged the score back to 29-25, before Watts-Jones calmed home nerves with a try from a lineout drive.